Clyde boss Danny Lennon has been named League 2 Manager of the Month for March while Chris McStay has been named the division's top player. Both have played key roles in the Bully Wee's unexpected surged into contention for promotion play-off spot. McStay, who only signed for Clyde in February, has admitted it would be the ultimate dream to follow in dad Paul’s footsteps and sign for Celtic. And Clyde boss Danny Lennon would love to help the young midfielder get there. McStay has already made a big impact with the Bully Wee in a short space of time since leaving the family home in Australia to try to crack the Scottish game. And having been brought up by one of the greatest players in Celtic’s history his ambitions are hardly a surprise. The 21-year-old said: “Of course, it would be the ultimate dream for me to play for Celtic one day – I think it’s a dream for most footballers. “I just want to continue improving and I have been able to do that with Clyde, which is great. McStay is thrilled to have been named Ladbrokes: League One player of the month and it’s a Clyde double as Lennon was the runaway winner of the manager’s award. 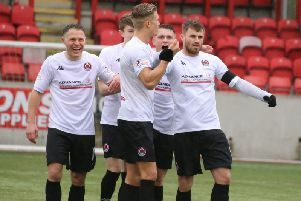 Clyde, who face Cowdenbeath today, racked up five wins and a draw to mount a real challenge for the play-offs. He added: “It was great to chip in with a couple of goals last month but my main function in the team is to create for others and if I can do that it gives me just as much satisfaction. “I could tell right away when I met Danny Lennon that he was a man with great experience and knowledge and I think we have all responded to his methods. “We have a chance of finishing in the play-offs and that would be a great achievement for Clyde – but we don’t want to settle for that. Lennon said: “Chris really deserves his award – although I feel a number of our players could have won it. “It’s a joy to watch him play. He is a very tidy, high quality player and there is still a lot more to come from him. “You want to keep all of your best players and Chris comes into that category. He hasn’t had a lot of first team football but Clyde have provided him with that. “Sometimes it’s out with your control but I would love to see Chris stay with us for next season. “Equally, our responsibilities as coaches is to try to get players to the highest level they can and that is equally as rewarding. “It gives me great pleasure, for example, to see Kenny McLean, John McGinn and Darren McGregor doing so well at the top level. “Winning an award like this shows that we are moving in the right direction. “All the hard work that the board have put in over the months and years is starting to pay off. “And it’s a sign that the players are enjoying their football and playing to a high standard. “We still have four very important fixtures to play and we are still very much in the mix for that final play-off spot. “t’s a sprint finish now and we need to make sure that all the good work is not wasted.